Closed environmental constraints aside, there are two other significant barriers limiting rapid mastery of intracorporeal suturing skills and instrumentation skills. Instrumentation initially relied upon adaptation of grasping instruments for the purpose of laparoscopic suturing. Limitations of general-purpose graspers are their inability to grasp and maintain the torque needed for driving needles through tissue. To overcome this problem, several manufacturers developed pin-vise-like needle drivers that would rapidly facilitate needle driving (Fig. 16). The torque problem was eliminated, but all the other problems discussed previously have not been addressed. The result is a perfectly good needle driver, but not a good intracorporeal suturing instrument. 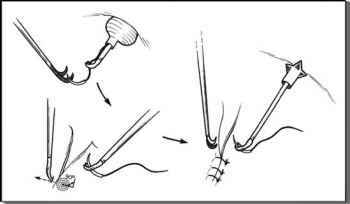 FIGURE 16 ■ Pin-vise laparoscopic suturing instruments. The design limits utilization of these needle drivers for few other purposes. FIGURE 15 ■ Argon beam coagulation may allow more effective hemostasis with less tissue necrosis. Both are essential features for advancing intracorporeal reconstruction. Source: Birtcher Medical Systems, Irvine, CA. FIGURE 17 ■ Various types of intracorporeal needle drivers. Each represents a unique design modification. What is common to all is the lack of finger rings that limit laparoscopic surgical dexterity. 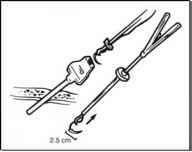 FIGURE 18 ■ (A) Classic finger-ringed instruments entrap the surgeon's hands. (B) Newer instruments allow fine manipulation of the instrument's tip without encumbering the hands. FIGURE 19 ■ A unique laparoscopic needle driver's jaws: Endolap™ Inc., contour tip with rack & pinion power drive. FIGURE20 ■ The Szabo-Berci™ parrot-jaw needle driver and flamingo tissue grasper close-up. FIGURE 21 ■ Intracorporeal passage of needles. There is no other function that the driver can accomplish and the second hand of the surgeon must multitask to facilitate just the needle driving. Brute force by the needle driver does not necessarily create an improved suture reconstruction. By forcing the needle along an inappropriate trajectory through the tissues, irregular spaced intervals, bunching of tissues, and inability to catch mucosa are all possible. Forceful needle drivers should not be allowed to replace surgical finesse. In a study of seven different needle drivers, the ergonomics of laparoscopic suturing was recently studied (142). Wide variability in the torque and flexion forces are obtainable. Specifically designed intracorporeal suturing instruments have been developed addressing many of the problems outlined previously (Fig. 17). 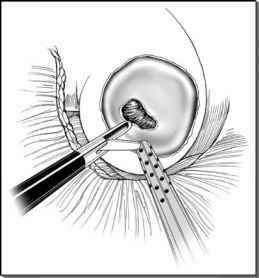 The shorter the needle driver, the less magnification of small movements at the tip from the surgeon's hands. By removing finger rings, the surgeon's hands are no longer entrapped. Fine movements with the palm or with the thumb and index finger can be accomplished (Fig. 18). In addition, because of the complexity of intracorporeal suturing, removal of the finger rings greatly eases the cramping and paresthesias that develop when the fingers and thumb are fixed within an instrument for hours. Finally, the needle driver's jaws are another essential feature affecting performance. Although most instruments rely upon the standard open diamond jaw configuration to firmly grasp the needle, other variations are just beginning to emerge as effective alternatives (Fig. 19). The only intracorporeal suturing set that provides an assistant tissue grasper and a dedicated needle driver are the Szabo-Berci™ flamingo and parrot-jawed instruments (Fig. 20). Curved-tip instruments allow the surgeon to identify cut edges, invert edges, identify both the entrance and exit bites with the needle and allow the surgeon to adjust the tension of the suture. Many individuals painfully aware of the limitations of current suturing instruments are beginning to develop "prototypic" devices. Agarwal et al. describe a simple 10-mm instrument with a fixed needle at the tip of the driver to facilitate intracorporeal suturing (143). The last barrier for accomplishing intracorporeal suturing is skill. Defined as the ability to do something well, intracorporeal suturing skill requires remastery of tasks surgeons use daily, but with much more attention to detail. This was referenced at length during our discussion of laparoscopic training. Intracorporeal suturing can be divided into three distinct tasks that can be practiced and mastered separately. These are needle driving, suturing, and knot tying. FIGURE22 ■ The principles of intracorpo-real needle driving. Movements should be slowed to the point of control and an understanding of the forces at the entrance and exit bites can prevent frustrating needle deflections. can be grasped along the straight shaft. An assisting instrument is utilized for tissue alignment and countertraction. Correct alignment and needle handling is crucial to preventing deflection of the needle within the driver's jaws as the needle point enters the tissue for the entrance bite. The most common problems encountered during initial experiences with intracorporeal suturing are frustrating deflections during the entrance bite, needle advancement, or the exit bite. It is recommended that while mastering this skill, the surgeon slows the motions down to the point of control and think about each step while maintaining alignment of needle, driver, countertraction, and tissues (Fig. 22). At the exit bite, the assistant instrument provides countertraction, and the needle is released by the driver and regrasped further back toward the swage and pushed through the tissues. At this point it can be regrasped by the driver (145).